Did you know that on average, an eight-hour wedding will result in anywhere from 500 to 800 digital images from which to choose? Although it’s a shoe-in your mom will love (nearly) every photo of your big day, narrowing down the selections you’ll want memorialized for years to come—in an album or on your walls—will require lots of editing and forethought. Which is why choosing a wedding photographer who matches your style from the get-go is so important. Genya Garrett and Wesleyann Knetzer, the chicks behind VUE Photography, who recently moved to Atlanta from Florida, share their secrets for making the right decisions. What’s your photographic style—and what is your story-telling approach? We’re definitely emotional chicks and feed off of the vibes around us. Our approach has a photojournalistic base with an editorial flair. No matter what, we always lean toward finding the lighthearted or humorous moments throughout the day. Your website says that the two of you are “emotion junkies.” What does that mean, and how does that translate to your work? One of the main reasons we’re in this business and attracted to weddings is because we crave the connection with our clients. To say we get a thrill out of our jobs would be an understatement. We chase the happy, we crave the heart-stopping moments, and we cross our fingers for tears of joy. When the images are viewed, we hope people can feel as though they were a part of the event, relate to the situation and bubble up with joy. We want our images to ooze laughter, tears, giggles and warmth! You two have been in business together for three years. 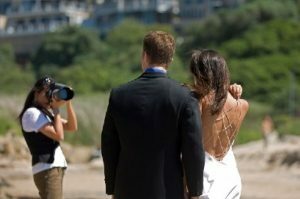 Explain why having two shooters is so critical in capturing the special moments of the big day. We truly are each other’s peanut butter to jelly, mac to the cheese, caffeine to the coffee. We feed off of one another’s energy! By having two shooters, you’re assured multiple views and angles on your event. Everyone wishes that they could be in two places at once … but unless you have a secret time machine or a clone, that’s just about impossible. By having two, you’re simply going to have more covered. Coming from Florida, you must still have quite a few destination wedding clients. How important are platforms like Skype and social media in connecting with your destination brides? We love to get to know our clients and give them a glimpse of our personalities, too. With many of our clients being out of the state, Skype has opened huge doors. It’s so much fun to sit down with a bride in Canada over coffee from hundreds of miles away. It’s something that we’ve just started and look forward to doing more. Facebook is another extraordinary avenue. It gives both parties a day-to-day glimpse of each other’s lives. Gone are the days of solo bridal portraits and pre-bridal sessions. What are the latest trends in wedding photography? For us bridal portraits are really few and far between. We compare it to registering for fine china; it’s kind of out these days. Clients seem to be going a more relaxed route by doing a day-after session where the goal is to enjoy your new get-up instead of packing it away (like china) and only bringing it out on special occasions. A day-after session allows you to get a little more creative with your images, visit fun locations, not worry about getting a bit dirty. Let your new groom carry you through a field, eat ice cream outside your favorite shop mid-July and get drippy, or even run toward the ocean waves! The possibilities are endless and memorable.